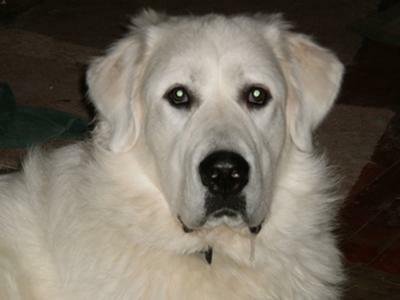 When we foster Great Pyrs we get to know our dogs quite well and seek to find the best suited “forever” homes for them. After all, a successful placement is one where the dog and the adopting family are both happy. From the moment Susan and Mike arrived, I knew they would take Rollie with them. Originally they had called about another of our rescues, Xanadu. However, knowing they had just lost their Pyr Merlin the week before, I knew (from doing rescue a few years now) that another old dog with health issues might not be the best choice for them, even as fosters. Also, these were experienced pyr owners. They had had 3 Pyrs previously and their daughter also had a Pyr. They were the firm, loving owners that a rascal like Rollie needed. They had experienced the perfect Pyr with Merlin - Rollie was not that at all! But I knew they had what it would take to bring out the very best in Rollie. And, sometimes getting a dog that is completely opposite to the one just past is what someone needs when losing a dog - comparisons can be heart breaking. As an aside, many of our rescues including Rollie, Bear, Rosie, Sophie, Oso and Churchill, to name a few from the past year, have all been adopted by people who have lost a Pyr and wanted to adopt a rescue Pyr. I think that says an awful lot about Great Pyrs and those who love them. As soon as Susan and Mike arrived, Rollie was his typical teenage Pyr boy self: basically being a rotten dog! He showed off for them, stole items (including their shoes), ran around like a lunatic, tried to claim their attention from the other 3 Pyrs.... and laid at their feet, tongue lolling. They decided to take Rollie as a foster-to-adopt. They were not committing, but we knew in our hearts they would adopt him. This dog, who previously had to be lifted into cars, now jumped right in. For people who didn't want to commit to adopting, they were shaking with excitement to take him home that day. My heart was tight, knowing the big goof was not coming back to me. It is a wonderful, horrible feeling for us foster moms (and dads). It’s why we do this, but it is not easy to say good-bye. (Luckily the adopters always keep in touch with me and I see “my” dogs flourish). Part of what we do, as rescuers, is help people find the right fit. Susan and Mike might not have been sure they were right, but we sure knew they were (but we let them figure it out themselves)! We kept in touch daily. Play dates with other dogs, long walks, trips to Petsmart, challenges with cats (in lieu of other Pyrs, who would he play with!? ), breaking into rooms, stealing gloves, copious treats, intense training sessions... we knew. However, they needed to be certain - especially having just lost a beloved dog and we were happy to give them this time. I first met Rollie when I decided to foster a pyr after having suddenly lost my precious 6 year old Pyr, Merlin, to osteosarcoma. Merlin was a true gentleman, elegant and calm, a dog that would make you proud anywhere you took him and I was devastated by his loss. Still grieving for Merlin, I did not want to adopt another dog, but with Merlin gone I did not know what to do with myself, as I live alone, but for 3 cats, in the country most of the time. A friend told me there was an older Pyr in need of a temporary home for a couple of months that was in Pyr rescue and I thought that fostering that dog for awhile would do us both some good. Maryanne, at Pyr rescue, after having heard my story, suggested I might rather foster a younger dog. Enter Rollie... a total clown right from the start. During our short visit in his rescue home, he relocated or downright stole several articles and lolled goofily at my feet. Maryanne said he didn't much like the car, but he hopped right into my car and settled in the back like it was his own and he stayed there calmly and happily for the hour drive back to my house. Since then we have been getting to know each other and working on his training and socialization. He is a clumsy, exuberant boy, with a penchant for theft, especially leather gloves and cat toys. Anything that dog finds or is given, becomes the BEST thing in the whole wide world and he will treasure it immensely. I gave him a rawhide bone that he has absolutely NO idea what to do with, but he has been carting it around for the last 2 weeks like it is the crown jewels. It goes everywhere with him. And he still loves that car, and any mention of going out in that car! Sometimes he can be quite stubborn and a challenge, but overall he has a very sweet and loving nature and he is so goofy in his ways that he keeps me constantly amused. I can't see him ever becoming an elegant and gentlemanly dog, but he has charm to spare; so much so that he is home for good now! “What a great dog.” That is what everyone in his foster family, neighbours and friends say upon meeting this big, goofy, lovely dog. It really does sum up Rollie. Rolland, or Rollie for short, was just two in November. 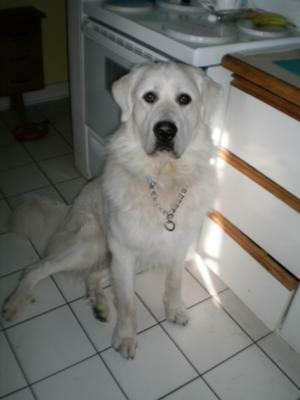 He is a large, beautiful boy with a typical Great Pyr temperament. As Rollie did not get exposed to very many humans as he was growing up, he has a tendency to behave badly when first greeting new people. He growls and sounds ferocious, however, he does have good bite inhibition. He is just scared, unsure and needs training. We have been diligent about keeping him away from newcomers through treats when he is not behaving badly, and then when he’s calm and quiet, the introduction is allowed to occur. At this point, he is the Rollie we know – goofy, happy to see you, wanting attention. As Rollie is a big boy, he needs more training to become a well-mannered big boy. Rollie came into rescue after his owner realized that although she dreamed of having a home in the country in retirement, life had changed: retirement was postponed and she would be moving to an apartment in the city to be closer to family. After trying to adopt him out herself, she realized Rollie was in better hands with experienced Pyr rescuers who would ensure he would go to the perfect home. Although he would not mean to harm smaller children, he is so energetic and enthusiastic that children over 6 would stand a better chance of … well, staying standing! As he requires training, a home with teenagers or an adult home is preferable at this point. Rollie has been raised with love and affection since he was a puppy. As such, he has a beautiful, trusting demeanor, playful and affectionate. He had never had the chance to play with dogs his own size before coming into care: he is completely beside himself with pleasure at wrestling with big white fluffy dogs. He has been good with other great pyrs, males and females. However, Rollie is a dominant boy – or will be someday. He was far too rough with an older, submissive dog that resulted in his being sent back into rescue. So, Rollie will either need a home with another large dog that he can play roughly with, or as a lone dog. He had never met a cat before, although had been interested in those he had seen on his walks. His foster family has a very dog-friendly cat, and Rollie is completely besotted. The cat is probably the only thing that can distract him from wrestling. 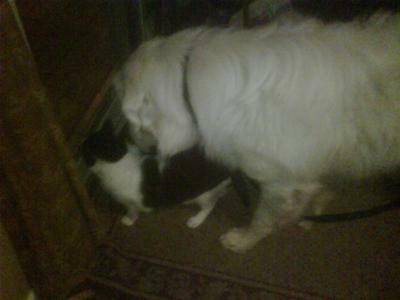 He is respectful and gentle with the cat, whether the cat wants to wrestle, cuddle or just walk by. His former owner warned that he has largely outgrown his puppy chewing, but to watch purses, shoes, pillows and books until you are confident he is not going to take them for a chew or just relocate. Since being in foster care, we have had a few leather items chewed, but for the most part, Rollie’s Relocation Service offers a drooly change of location for dish towels, socks, xmas presents, etc. without damage! Rollie was a terrible counter surfer when he arrived in foster care, but has been consistently told “off” or “down” so that actually improved quite quickly. He is so food-motivated (food! Did someone say food?) that training him is quite easy. Rollie has been through dog training, but absolutely needs a refresher. He pulls very hard walking; a halti is a good idea (he hates it) or a lot of practice with him. He is in very good health; at 110 pounds, he is large but not chunky, very quick and agile, although he has his puppy awkwardness at moments! He is up to date with his vaccinations and neutered. He has been on a good diet all his life, with regular exercise. Rollie has a benign growth on his hip that has been monitored, and is actually shrinking; it is nothing to worry about. It should be monitored at his yearly visits to the vet, however. He will be micro-chipped before being adopted. Rollie will be a wonderful family dog with some training. Or, a faithful, laying at your feet adoringly, companion for someone living alone who wants the reassurance of large, loyal dog. A special big "Thank you" to Rollie's new parents for providing him his "forever" home. It is your love and kindness that makes our work meaningful. I has been close to 2 years with Rollie now and, although he is much better behaved, he is still a wild and crazy guy. He is a 10 on a scale of 1-10 pyr activity, which is quite something considering he will be 4 at the end of Nov.! I thought he was getting calmer, but turns out he was sick. Not to worry, it was just a bad tummy upset and he is all better now! He still loves to try and put one over on you whenever possible and is still crazy about leather gloves. I have to warn people who are wearing them not to take them off to pet him, because he will try to take them! It has now been a little over one year since Rollie came to live with us. He has turned out to be a wonderful dog. He now walks beautifully on leash and is well mannered and playful with other dogs. He still has a penchant for making off with leather gloves and cat toys whenever the opportunity arises. We live near a lake, and although he prefers not to swim, he loves to wade and will duck his head under the water in attempts to catch little fish. He is good off leash in the woods, never wanders too far and has a really good recall.